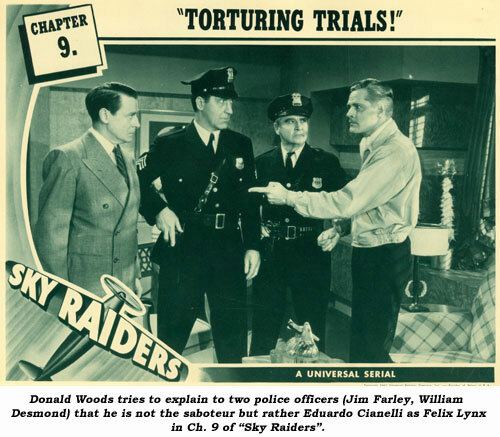 Serial Report Chapter 92-Sky Raiders serial; Noel Neill. 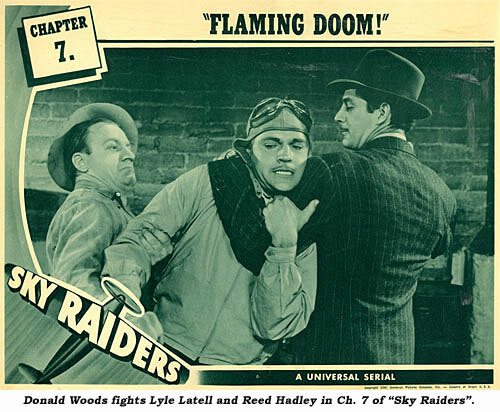 “Sky Raiders” (‘41) is one of Universal’s most obscure serials. Aviation serials had earlier become a staple of Universal chapterplays beginning with “The Airmail Mystery” in ‘32 followed by “Phantom of the Air” (‘33), “Tailspin Tommy” (‘34), “Tailspin Tommy in the Great Air Mystery” (‘35) and “Ace Drummond” (‘36). After spending a few years with “Flash Gordon” and “Buck Rogers” Universal revived their aviation theme to coincide with the looming threat of WWII. 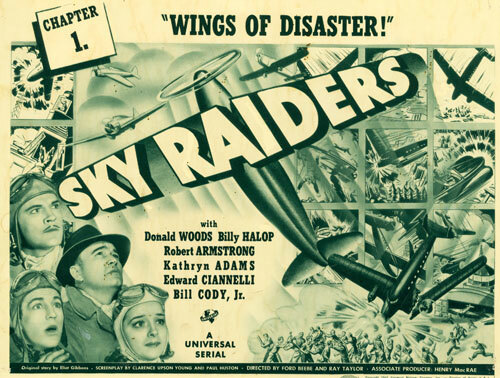 The Sky Raiders was a WWI squadron whose veterans, headed by former ace Captain Robert Dayton (Donald Woods) and Lt. Ed Casey (Robert Armstrong), organized Sky Raiders Inc. as part of our national defense to manufacture fighting planes for the U.S. Army. Kathryn Adams is Dayton’s faithful secretary Mary who insists no matter the danger, Dayton leads a charmed life. Dayton hires Tim Bryant (Dead End Kid Billy Halop), a member of the Air Youth of America, and an expert model plane builder to do experimental design work for him. Dayton has perfected a miracle fast pursuit plane which ruthless foreign agents (never named but obviously Nazis) led by Felix Lynx (Edward [Eduardo] Cianelli) are out to steal. 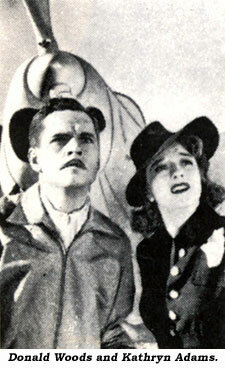 In his numerous—and failed—attempts to steal the plane or its plans, Lynx is aided by glamorous feminine agent Innis Clair (Jacqueline Dalya) and English aviatrix Countess Irene (Jean Fenwick) both of whom worm their way into Dayton’s confidence—much to the continuing jealousy of Mary who is in love with Dayton. (This subplot is a highlight of the serial.) 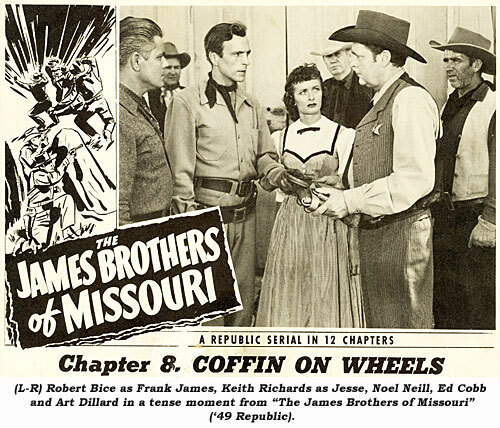 Lynx’ other confederates are played by Reed Hadley, Irving Mitchell (secretly working for Sky Raiders as Comptroller), Edgar Edwards, John Holland and Frank Richards. Young Bill Cody Jr. (son of the B-Western star) and another member of the Air Youth of America, turns up in Ch. 3 to aid Dayton following a crashed plane. Speaking of plane crashes—seven of the 11 chapter cliffhangers end with either a plane crash or an about-to-crash-plane. Stuntmen Tom Steele, Ken Terrell and Dale Van Sickel found work away from Republic doubling Woods and others in fight scenes. There is some well-done airplane model work aided and abetted by plenty of stock footage—including a glaring flop shot of a Navy ship with the ship’s identity numbers being glaringly noticed backwards. The “Sky Raiders” cliffhanger of Ch. 4 shows a woozy Donald Woods attempting to land a plane just before it crashes. In Ch. 5 he jumps from the plane before ever trying to pilot it safely to a landing. 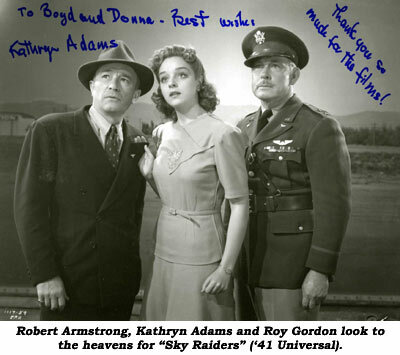 Kathryn Adams Recalls "Sky Raiders"
“The serial was, as the kids say today, ‘a hoot’ all the way through. It really is an historic document, isn’t it? The techniques of filming have changed so much over the years that ‘Sky Raiders’ seems like a contribution to the Antique Road Show, which is the way I felt about myself when I attended my first film festival in Memphis. One of the reasons the serial was so much fun for me was because one of the producers, Don Brown, became a good friend and he would fill me in daily about how they would search for stock shots that fit the action, and then create the dialogue to match the stock shots. The late Noel Neill will be forever remembered to millions of television viewers as Lois Lane. 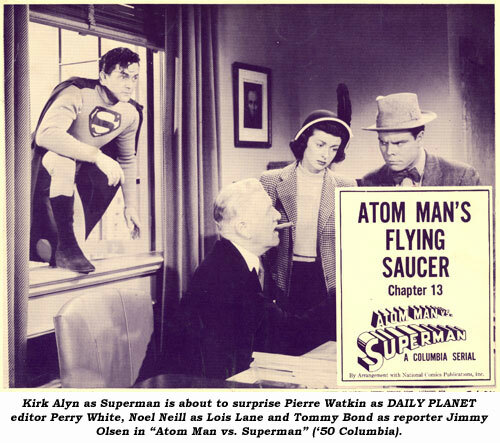 But the dark haired Paramount starlet of the ‘40s had a cinema life before “Superman” (1951-1957), and Westerns were a significant part of it. A cross country road trip with her mother found them in California with relatives where, “…by chance somebody’s friend said would you like to audition for a singer? I’d sung since high school. I did, got the job and went to a thing for Bing Crosby’s orchestra down at Del Mar. I met a lot of people working there. All of them were in the biz, one way or another, so I got started at Paramount. ‘Henry Aldrich For President’ (‘41) was my first. I was put under contract to Paramount after I did that Henry Aldrich picture.” The five-foot-two starlet went on to appear in over 16 films for Paramount between ‘42-‘46. In 1946 when her contract expired at Paramount, “I signed up with Monogram for seven of the Teenagers pictures. You work pretty fast in those cheapies. June Pressier was stuck up because she’d been in Vaudeville before that, she thought she was a star. I didn’t like her much. And vice versa I guess.” One of the seven Teenagers films, “Vacation Days”, was set on a dude ranch out west and featured Western stalwarts such as John Hart, Terry Frost, Hugh Prosser, Forrest Taylor and Spade Cooley’s band. 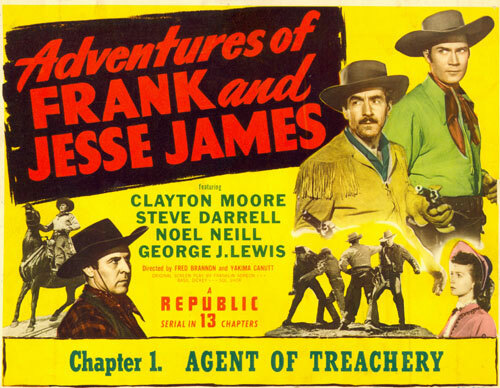 Noel’s first true Western was on loan-out to Hal Roach in ‘43, “Prairie Chickens” with Jimmy Rogers (Will’s son) and Noah Beery Jr. “(Laughs) I remember working on that. We shot over at the lot in Culver City. All the ‘girlies’, a couple that were fairly well-known in those days (Rosemary LaPlanche, Tommye Adams). We called Noah, Pidge.”Another Western was “Over the Santa Fe Trail” ('47) with Ken Curtis and the Hoosier Hotshots at Columbia. “That’s where I did the singing thing. They were trying to make Ken Curtis into another Gene Autry.” Noel’s Westerns in the next few years with Whip Wilson, Lash LaRue, Jimmy Wakely and Johnny Mack Brown are a faded blur in her memory. 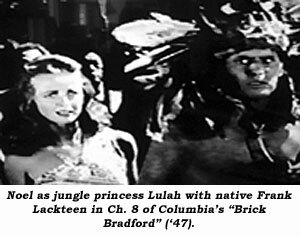 Noel’s first Columbia serial for Sam Katzman was as the sarong-clad Lulah, a beautiful but untrustworthy jungle princess, in Ch. 7-8 of “Brick Bradford”. According to SUPERMAN: SERIAL TO CEREAL, “…the complexities of Robert Maxwell’s nature soured many of the associations he maintained in ‘51. He was appreciated better from a distance.” Whitney Ellworth, a pulp fiction writer in the ‘30s, was hired as National/DC Comics editorial director in ‘40. 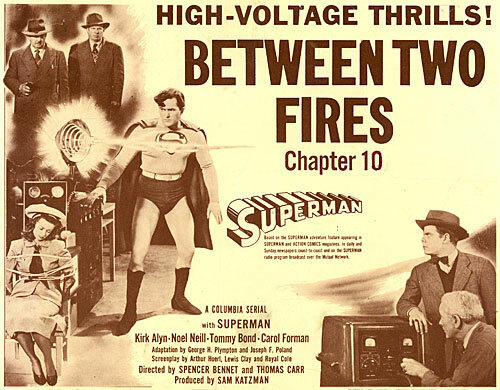 He had already been involved in other DC Comics to film projects—“Congo Bill”, “The Vigilante” and the “Superman” serials. It was he that tranquilized the violence of the Maxwell produced episodes and brought a more comedic approach to the villains, and finally color to the series. At 95, Noel died July 3, 2016, at her home in Tucson, AZ.